Before we went away to London and France for five weeks I spent hours on the net finding THE places to eat and exactly what local specialties I shouldn't miss. Emma sent me a series of web addresses for patisseries around Paris, which I duly noted down. I sat up until late in the night to be first in line when River Cafe bookings opened in London and even managed to get my French up to a level where I could speak with the staff in restaurants - none of which had email - to make our bookings. And eat we did, at the glorious River Cafe (strawberry Bellinis, Scottish langoustines, spring lamb with broad beans and mint, zabaglione icecream), at Chez Dumonet - Josephine (duck liver pate, beef bourgignon, Grand Marnier souffle and a bottle of something incredible), and lovely salted caramel icecream from Berthillon on the Isle St Louis in Paris. But life is full of surprises and it was the food that we didn't expect at places we'd never heard of that was the most memorable. All over France we stumbled on gorgeous food experiences, not only in little restaurants but also in markets. We ate buttery grilled sole on the quayside in Normandy, roasted guinea fowl in a back street restaurant in a village out of Dijon, kouig aman out of a shop window in Dinan (that's a rich brioche with a warm salted caramel base), spicy home made dried sausages from market stalls all over the country and strawberries dripping in juice with a flavour so intense that I felt it couldn't be real. 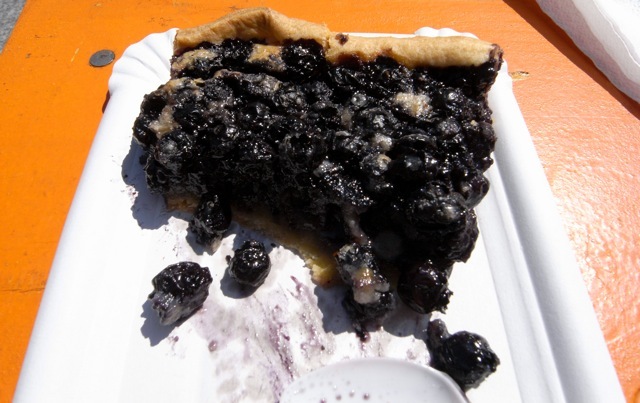 But the very best thing on the whole trip was this blueberry tart, made by a farmer's wife and sold in great warm chunks from her blueberry stall at the bio markets in Strasbourg. She served it straight from a portable oven and it had a sort of warm gooey sweet syrupy business at the bottom of the tart. I had wolfed down half of it before I even remembered to photograph it. Heaven.